Hi, you have my name on the guestlist. With those words I entered the Mercury Lounge. And yep, they let me in. It’s not who you are but who you know….And I know Jacco Gardner, who was performing that night. His music - barokpop, think 60’s with psychedelic tunes- is not really my cup of tea so I was a little bit weary. And all alone because Esther had crashed after a couple of sleepless nights and the half marathon we ran that day. But man, I totally enjoyed it! I enjoyed Jacco’s performance, but also the atmosphere and the people I met there! It was the Saturday of the half marathon in Queens. We had gotten up early and had come back frozen. To make a long story short; Esther decided to stay at The Jane. Since it was a nice evening, and I had seen on my Iphone that it was a pretty easy route, I decided to go and walk. Give my legs a little post run stretch. The little blue ball of the maps app on my Iphone showed me the way all along Bleeckerstreet. Which happened to be on my "that’s-what-I-would-like-to-do” list already for a long time! Almost directly I passed the Marc Jacobs store, which had been on Esther's "that’s-where-I-would-like-to-go” list for a long time. That kept a smile on my face for a while during the 40 minute walk toThe Mercury Lounge. Picture this; you’re by yourself in a crowd with a beer in your hands. Jacco is tuning his instruments and no longer has time for you after a quick "heyhihow’slifegoodtoseeyouhere”. And then you hear something familiar on your left and it so turns out that you’re standing next to 3 Dutchies! In the middle of a pretty packed place, next to you, is a couple who live in New Jersey and were at the Mercury Lounge with a friend who's visiting and who had read that a Dutch guy was performing there. Thanks to them it turned out to be a fantastic evening that we ended with a sandwich at Katz’ Deli (from the famous scene in "when Harry met Sally"). 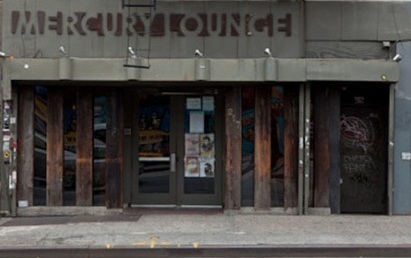 The Mercury Lounge is described as "one of the better places to catch a live show in the East Village". It’s not real big and looks like a candle lit bar when you come in. The stageroom is behind the velvet curtains, in the back. It’s pretty intimate and you’re never far from the stage. Mostly beginning bands perform at the Mercury Lounge.